I overheard the greeter at church make fun of my outfit after I walked away today. What’s wrong with people? My church told me today that they wanted me as a greeter to work on my social skills . . bunch of jerks. Walked past the church greeter 4 times and he still asks me if I want a bulletin even through every time I say I already have one. I walked into church today, and the greeter whispered to the man next to her that I look like a model #thank you. Never before have said so many cheesy weather jokes than before I became a greeter at church. Greeter when I walk into church: “Is it your first time here?” Me: I’ve gone here for 17 years. I’ve never been to a church (before today) that didn’t have any greeters at an entrance. This is weird. Speaking of your church’s hospitality, the guy who helped himself to my wallet my want to return all my credit cards at this time. If you’re colder to people than the weather was this morning, you probably shouldn’t be a church greeter. The greeter at my church asked me if I own a pair of shoes — I’ve never seen any “No Shoes, No Service sign.” Back off man. People in the street are more friendly than some church folk, you go out of your way to speak and they treat you cold. How do church volunteers find the worst donuts on the earth for the hospitality table? Like, how? So a greeter at my church complimented my facial hair, . . .. I’m not sure exactly how to feel. These things should never be said about a local church. Simple attention to church hospitality from a pastor, a committee chairperson or the team can fix many of these gaffes. 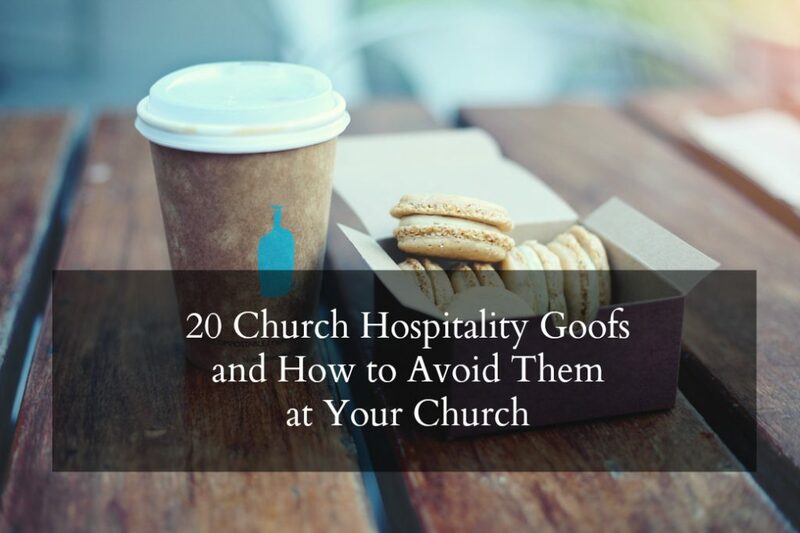 If you don’t regularly review your church hospitality and work at continuous improvement, these mistakes will appear with greater frequency to the harm of your mission. I’ve compiled this quick sampling of resources on this website to help you. Find ways to improve the greeting ministry of your church. Maybe you can share this list of small talk tips for nervous church greeters. Read this tutorial on how to fix your hospitality vision. You can get the Church Greeter Training DVDs from the store, as a DVD or digital download. Share this video in an email to your church greeter team: Ten Useful Tips for New Church Greeters. Do a Quarterly Review Of Hospitality Ministries. The ebook I sell can be one way to review your systems, or take the time to do your own hospitality audit. There are others available from Amazon that could help. If your church hospitality leader is new to the position, start here with 8 First Actions Steps for New Hospitality Committees.